Aweber Review. Is it an Ideal Autoresponder For You? Aweber is arguably one of the most popular autoresponders utilized by both online/offline businesses. I’ve personally used it for a little over 5 years and would like share my personal review of it. Web forms are very easy to create and put up on your website. Features follow up sequence emails to stay in touch with your subscribers without having to monitor every tiny detail. Excellent support (Online chat + email). Features many ways to decorate emails. Contains analytics to help you better promote to your list/s. Allows broadcast emails to be send on whatever date/time you wish. Good/fair price compared to other competitors. Currently they have a 1 month free trial. No limit to how many subscribers/email lists you can have. May be a slight learning curve issue. This varies among people. Not really a good idea to purchase an autoresponder if you don’t have any list building plan in mind. An autoresponder is a program which helps you collect emails. Sure you can ask people to email you on your website, but most of the time, they won’t, or you’ll have a difficult time keeping track of everyone. With an autoresponder however, you will be able to place a “sign up form” on your site to make this process much easier. Follow up email: Follow up emails are basically prepared emails that will be automatically sent out whenever you want. I personally prepare 10 followup emails to be sent out every 7 days after a subscriber joins my list. This keeps in the information coming to them without me having to constantly monitor anything. Some may argue that you can do followups yourself, but as your email list becomes bigger, I promise you that process will become more and more difficult, to the point of impossible. And I would not recommend using a free autoresponder (bad quality) or worse ones with prebuilt leads (overpriced scams!). Broadcast: What if you want to notify everyone on your list of an upcoming event/sale? A broadcast is what you’d want to do. It’s just a email that will be sent out to everyone on your list. Through Aweber, you can pick the exact time/day you want it sent out. It can be when you’re sleep, on vacation, out of office, ect… and it’ll do it automatically. I create an email list for my specific site. I make a few follow up messages to be sent out once every 7 days to new subscribers. I then create a web form for my particular list. Once the form is done, I just take the code Aweber gives me, paste it into the proper area of my site and voila, I’m ready to collect emails. Additionally Aweber also features a “spam radar” where they’ll rank your follow up emails/broadcasts on a 0-5 scale (example below), 0 being fine and 5 being spam. Depending on how you write up your email, the radar will rank it within this scale and let you know if it’s safe to send out. After all, what’s the point of sending out emails if they’ll all land in people’s junk folders? One of my biggest pet peeves with any kind of service is customer support. With Aweber, it’s top notch. 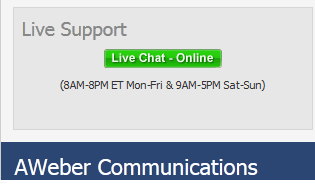 Among the obvious things such as FAQ’s, opening Tickets and Email support is also an online chat which is in my opinion the best feature of Aweber’s support system. This is very helpful to me whenever I have to ask questions, which will happen from time to time, no matter who you are or how experienced you may be. Not every autoresponder out there has this feature. I can honestly keep going into great detail about what this program has to offer, but for most people, it’ll be difficult to understand everything so I’ll keep it simple. Here are some scenarios you may currently be in for which there is a YES (Get aweber) or NO (Don’t get Aweber) response. 1. If you own a business and are going to take it to the online world, you will need an autoresponder. Aweber will meet your needs. It’ll be easy to set up and get it running. Yes! 2. If you already have an online website/business, it’s getting visitors on a steady basis you and want to start building an email list from this, Aweber is perfect. Yes! 3. If you have a website, but don’t know how email marketing works, how to get visitors to your site, then you need proper training. No. 4. If you don’t have any business, but are planning on starting one online, I’d recommend starting here & holding off on buying any autoresponders/collecting emails until you’re ready. No. The bottom line is simple: There is no point of getting any autoresponder if you don’t have key foundations in place: A website & traffic. If you already have this down, then get Aweber. Aweber is ideal for pretty much every list building scenario and online businesses. It’s easy to use, it’s cheap and the support is great. I am personally very satisfied with it and highly recommend it. Currently, you can try Aweber for $1 for the first month and see how it works out for you. Every month after that is $19.99 for every 10,000 subscribers. How can I contact you to discuss getting a review on your website? Although not perfect, Aweber definitely does the job. They provide a quality service and they have definitely evolved over the past 8 years since I started using them personally. If you are an Internet/affiliate marketing the service at Aweber will more than suffice. You will have frustrating moments where your emails didn’t get sent as intended, but they are few and far between. Don’t get an aweber account until you have traffic coming to your website. You are jumping the gun if you do. In order to build a list, you have to have people to build a list. I see far too many folks thinking they need aweber right away, when in the real world, it becomes beneficial once you have a medium getting traffic. Right on the money Kyle. There’s no point in getting an autoresponder unless you already have traffic to collect the leads. Focus on traffic first, then use Aweber. Very informative article. I am not in a place yet with my site where I need to build lists but it is something I will move to some time in 2014. It’s great to hear it’s so easy to set up with Aweber i.e. just getting the code and pasting into the site. Top stuff! Establish a presence online, especially if they don’t own a physical business. This means learning how to get quality traffic and improving their SEO. Once all that is complete, you can then focus on funneling that traffic and building a list of it, for whatever purposes. Lots of good info here. I have Aweber but have never used it properly. Do you think it’s useful even if I don’t get a lot of traffic? How would you compare it to a “subscribe now” form like Feedburner? Do you think it’s useful even if I don’t get a lot of traffic? Yes, however, you have to understand if having an autoresponder is right for you. If you intended on capturing visitors and keep in touch with them, you can certainly do that, no matter how much your traffic. As long as your niche is specific as is your audience, you’re fine. Every lead is a potential friend/customer/re-occuring client. 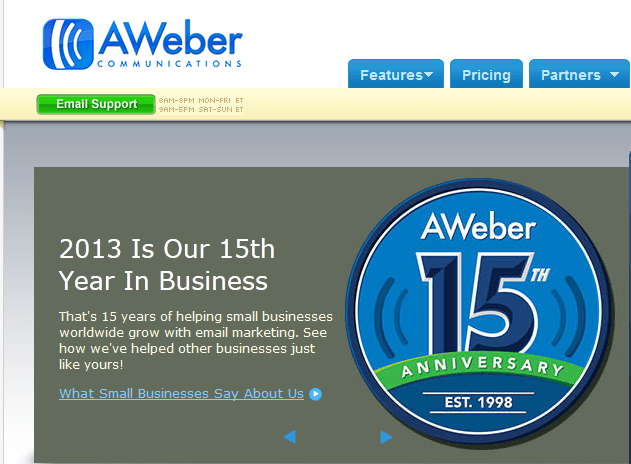 And because Aweber only charges you $10/month after the first month, it’s no biggy in my opinion. I have a website where I provide free lessons to people on martial arts. I have a newsletter there where they’ll sign up and I’ll inform them on every new post I put up there. The benefits? I give them quality content and they return to my site, leave feedback, likes and I also gain their trust. I also sell them relevant items and eventually plan on creating a DVD series on the subject of the site. That’s my personal thing and I’ve had other projects where I would just collect email lists and then provide info/product recommendations. It can be VERY profitable and fulfilling, but it isn’t for everyone. I hope this answers your question. Let me know if you have anymore 🙂 (sorry for the long response).